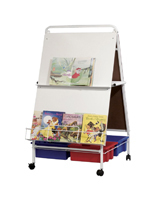 This Kids Art Easel Is In-Stock and Ready to Ship. Only Limited Quantities Are Available. 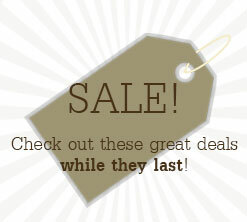 Get This Kids Art Easel At A Low Price Online from This Site. 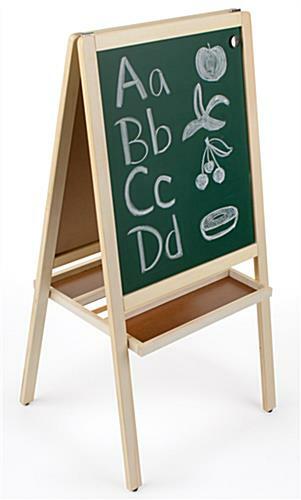 Dual-sided easel with one side green chalkboard and the other is white wipe off marker board. Features natural wooden trays for storing writing instruments. Natural finish wood frame designed for many years of use. This kids art easel is a great educational tool for early childhood classrooms and learning environments. Children can be as creative as they want with this write-on board. 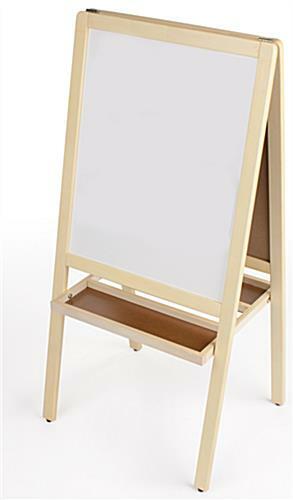 This kids art easel, such as write-on board is double-sided! One side has a green chalkboard and the other side is a white board. Users can use regular stick chalk to write on the chalkboard and wet-erase markers on the white surface. 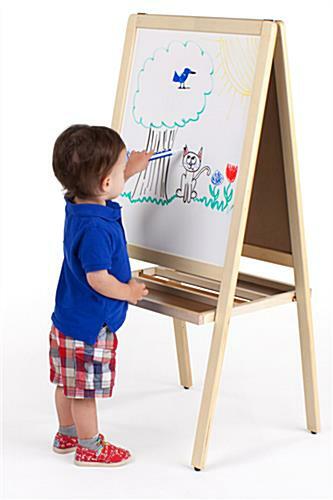 This write-on board, write-on kids art easel features a 17-5/8" x 22" writable area. The generously sized chalkboard and dry erase board gives young artists plenty of space to produce their artwork. Drawings and artwork can be easily wiped away by using any damp cloth. 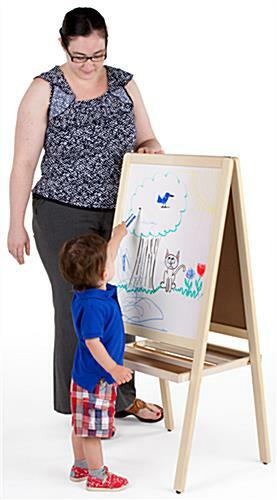 This kids art easel that is two-sided allows two children to create drawings at the same time. The wooden write-on display inspires creativity and imagination of your little one to create their next masterpiece. 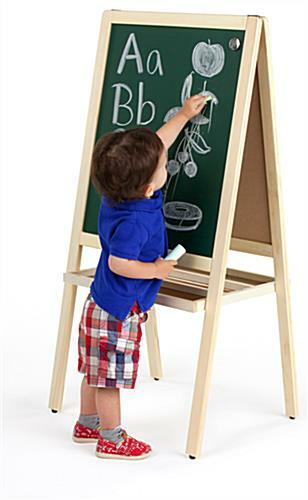 A wooden chalkboard, kids art easel is perfect for encouraging creative play and artistic exploration. The write-on board can be used over and over again for drawing or playing games. Therefore, this classroom kids art easel is a great substitution to one-time use paper rolls. Users could also use liquid chalk pens to write on the board, but the cleanup may require a bit more work. For that reasons, a magic eraser is included with the unit. This kids art easel that features a green chalkboard has a magnetic surface which uses magnets to hold the important print-out sheets in position. Each unit is specifically constructed from wood that can last for a long time. The frame also features rounded edges for safety purposes. This can also help to prevent injury from sharp edges. As a result, this kids art easel that has a natural wooden frame is ideal for use in places like classrooms, playrooms and day care centers. 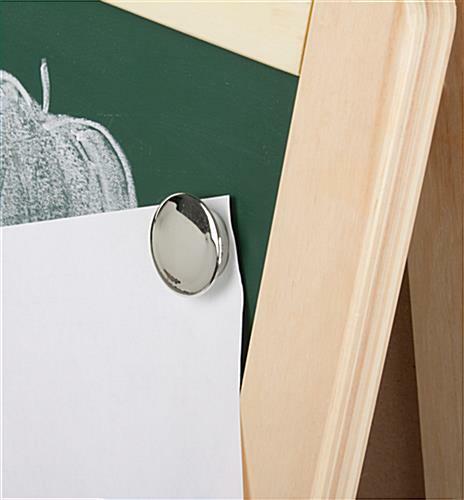 The unit is also made with rubber feet to keep the chalkboard in place and prevent from scratching the wooden floor. At the bottom of the write-on board, there are two trays provided for storing writing instruments such as chalk and markers within easy reach. Markers and chalk are not included with the unit. When not in-use, the wood frame chalkboard folds flat for convenient storage and mobility. Buy this wooden write-on display at a low price and encourage the little one's artistic talents with this two-sided write-on board. 20.5" x 42.0" x 16.0"